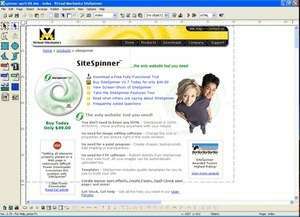 SiteSpinner is designed to be an all-in-one website creation tool easy enough for beginners, but with powerful features that they can grow into. Its use of industry-standards enables precision drag-and-drop design that lets you position text, graphics, foreign objects and words exactly where you want them. The built-in FTP Publishes your web pages - all files associated with your site are 'gathered up' and up and uploaded to your webhost. For security reasons, you should also check out the SiteSpinner download at LO4D.com which includes virus and malware tests. Additional screenshots of this application download may be available, too.